I visited my sister over the Christmas holiday. I only got back a week ago. I'd pretend that I've been busy unpacking and doing awesome crafty things, but I've spent a week being ridiculously lazy! I did, however, get to go to the halfway party for my husband's ship! The theme was Old Hollywood Glam. I had a lot of fun! Me and some of the other wives! I was also put to work while visiting my sister! She had two projects she really wanted me to do. One was this little shelf. Yeah, not too much to look at. After some wood filler, primer, paint, and some Ansley-fication it looked like this! Check out my tips for painting furniture here! Since I didn't have any of my tools, aka. my silhouette machine, with me...I had to stencil old school. I printed out the image the full size of the page, cut it out, and used it to trace around lightly with a pencil. 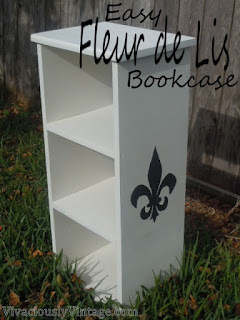 Then I just used a small paint brush to stencil the fleur de lis on the bookshelf. Here's a couple more shots of the fleur de lis bookcase. I think it's really cute, and she's very happy with it! I'll bet if my other sister ever looks at my blog she will be jealous. She loves fleur de lis, too!